Graysonline has been operating in Australia for the past 100 years (according to the site). The whole idea of the site is to post auctions from cars to fire damaged stock basically acting as a liquidation business and online retailer. They have always sold alcohol and personally I have picked up a number of cases (sometimes too often) from the site. But recently they have launched a site dedicated solely to the wine sector of the business at www.grayswine.com.au. On the standard Graysonline site the items can be separated Into auctions and auctions lots. Auction items work much like eBay in that single items are sold by the site and auctioned off. The auction lots are “sales” with products relating to that sale posted under that banner. 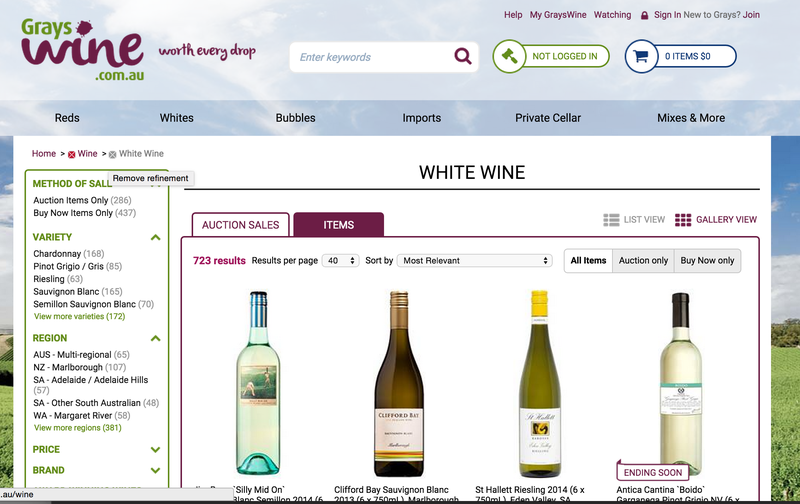 The wine site is much the same and is split into buy it now and auction items. On first appearance the site is clean, modern and well thought out. The standard Graysonline site is sometimes confusing and very busy. The wine sales are categorised into the usual red, white, sparkling and mixed varieties. The selection we reviewed was under the buy it now premise and the pricing seemed fair compared to the market. For example Grays wine are charging $233.94 + $10 shipping for 6 bottles of Stonier Chardonnay 2012, whilst Mr Dan is charging $236.85 + $7 shipping. In this example Dan Murphy’s is cheaper by a whole $0.09! The site also offers a 30 day money back guarantee. Now this is interesting as the guarantee states that if you don’t like the wine just contact them within 30 days and they will provide a refund. There is nothing worse than buying a case of wine to only find you don’t like the taste or flavour. In my eyes this takes the risk out of buying new wines or types of wine! With Graysonline the standard buyer’s premium applies to auction items only, which is added to your total price on payment. The premium varies from each auction but seems to be around 17.5% of the auction price. This is good as auction prices can be whatever the market or the site users dictate. After using Graysonline multiple times for wine i will now have no issue in dealing with the grays wines site. From what i have seen the site is great and offers comparable value to standard lines and even more value to auction items.